Which Windows 8 version is right for your small business? Regardless of whether your business is Fortune 500 big or mom-and-pop small, transitioning to a new operating system is a major endeavor—and a major headache. There's a reason why so many companies still use Windows XP, after all. So when you do bite the bullet, you want to make sure you're picking an operating system that meets all your needs. But wait! The decision-making process isn't done once you've decided to transition your company to Microsoft's latest operating system. Like previous versions of Windows, Windows 8 comes in several editions. There’s the basic, straightforward Windows 8—similar to the Home edition in previous versions of Windows—as well as costlier Windows 8 Pro and Windows 8 Enterprise versions, both of which offer additional business-friendly features. Which is right for your business? It all depends on your company's particular needs. Let's break down what each version of Windows 8 brings to the table. The differences between the various Windows 8 editions go beyond their retail packaging. Most small businesses will be fine running the standard version of Windows 8, which we covered in-depth in our official Windows 8 review. While the flashy visual overhaul may have given the OS a whole new look and feel, Windows 8's desktop mode is basically Windows 7 sans a Start button—along with several under-the-hood tweaks that improve the operating system's overall speed and responsiveness. That's not to say the stock version of the OS skimps on new features. Windows 8 raises the bar on the security front, offering a multitude of core improvements, while the addition of file histories, improved multi-monitor support, native ISO and VHD mounting, amalgamated Storage Spaces, and a streamlined Task Manager make it easier to get things done on a day-to-day basis. From a direct productivity perspective, Windows 8 boots up, shuts down, and wakes from sleep faster than greased lightning, especially if your business has invested in solid-state drives. Before you dive into any version of Windows 8, however, consider the potential training and support costs you might incur by adopting Microsoft's new-look operating system. The modern UI-style Start Screen is a radical shift from the traditional Windows desktop (which is just a live-tile click away), and usability experts say that Windows 8's flat design and hidden controls are unintuitive for average users. We found the learning curve moderate at best, but you will need to invest some resources in educating your employees about Windows 8. If touchscreen support isn't a major concern, think hard about whether Windows 7 or Windows 8 would be a better fit for your business. 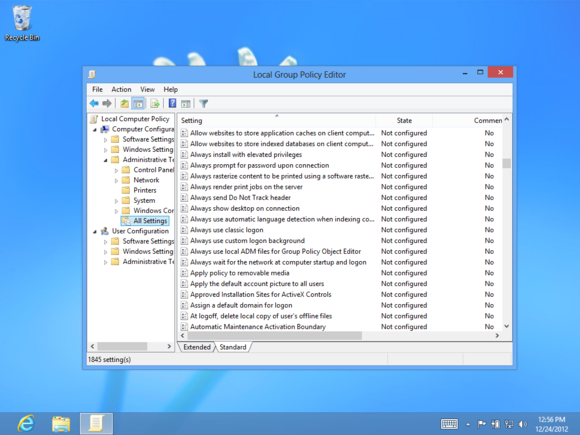 Group policies: If you need 'em, you need Windows 8 Pro or Enterprise. Domains and group policy. Does your business use a centrally administered network with a Windows Server domain and group policy? These features allow an organization to centrally manage a network, including user profiles and computer settings, from a single server. Many businesses rely on domains and group policies, and only computers running Windows 8 Pro or Enterprise can use them. BitLocker and EFS. BitLocker makes a return in Windows 8. It’s a full-disk encryption solution that can encrypt entire hard drives, including your Windows system drive or even USB drives (with BitLocker To Go). Once you've encrypted a drive with BitLocker, anyone who powers on the computer or connects the USB drive will need to enter the encryption key, or the drive will remain locked and inaccessible—a useful feature if you’re dealing with sensitive customer information. Windows 8 Pro also packs support for Microsoft's encrypted file system (EFS) technology. Businesses that need Windows 8 Pro only for its encryption features can try using TrueCrypt, instead. It's a free, open-source encryption solution that works with all desktop versions of Windows. The Windows 8 version of Hyper-V lacks the native Windows XP virtualization support found in Windows 7's version. Now you need a license key to run a Windows XP virtual machine. Hyper-V. Hyper-V is an integrated virtualization solution that has made its way from Windows Server to Windows 8, although it's missing some of the Server edition's more exotic options. Basically, it's useful for running multiple virtualized servers on a single Windows system or for installing other guest operating systems within Windows 8 for software testing. If you’re not sure whether you need Hyper-V, you probably don’t. Even if you need virtualization support, however, you don't necessarily need Hyper-V and Windows 8 Pro. VirtualBox, a free piece of virtual machine software, works on any Windows system. (You can also use VirtualBox to try Windows 8 for free.) VMware Workstation is another popular workplace virtualization product, although it isn’t free. Remote Desktop hosting. While any Windows 8 PC can use Microsoft's Remote Desktop app to connect to a host computer, only Windows 8 Pro and Enterprise installations can be configured as a host PC and accessed from afar. Most small or medium-size businesses won't need the advanced features found in Windows 8 Enterprise, which sports super-specialized tools that are more useful in large enterprise environments—hence the name. In fact, while Microsoft is happy to sell anyone copies of Windows 8 and Windows 8 Pro, you’ll need to have at least five PCs in your business and you'll need to participate in Microsoft’s Volume Licensing program to receive access to Windows 8 Enterprise. We've covered the biggest benefits of Windows 8 Enterprise in a separate post. One of the brightest highlights is Windows To Go, which allows employees to boot into a full, manageable, and BitLocker-encryptable version of Windows 8 Enterprise off of a USB thumb drive. It's a great solution to the conundrums posed by the BYOD trend, but most small businesses can likely get by without it. Software limitations neuter the business potential of Windows RT tablets like the Surface RT. Windows RT can't be purchased directly; it's only found preinstalled on ARM processor-powered Windows RT tablets such as the Microsoft Surface RT. Windows RT largely mimics Windows 8, but unlike its PC-focused counterparts, Windows RT cannot run traditional desktop programs. Instead, it can run only the Modern-UI-style Windows 8 apps found in the Windows Store, and while the Windows Store's app selection is improving, it's still generally lacking in both quantity and quality. The inclusion of the Office Home and Student RT suite is a major boon for Windows RT tablets, but licensing technicalities stamp out its legal use in the workplace. "As sold, Office Home & Student 2013 RT Preview and the final edition are not designed for commercial, nonprofit, or revenue-generating activities," explains the Office Home & Student RT FAQ page. "However, organizations who purchase commercial use rights or have a commercial license to Office 2013 suites can use Office Home & Student 2013 RT for commercial, nonprofit, or revenue-generating activities." Major bummer. Be sure to keep those considerations in mind when you're choosing between Windows RT and Windows 8 tablets for your company. With full-fledged Windows 8 tablets like the Acer W510 and Dell Latitude 10 starting to show up for $500—roughly the same price as a Windows RT tablet—it's hard to recommend picking up a Windows RT tablet for your business. The available upgrade paths from Windows 7 to Windows 8. While you're deciding which version of Windows 8 is right for your SMB, keep in mind that your current Windows 7 installation may constrain your Windows 8 upgrade path. The chart above comes from the surprisingly comprehensive Wikipedia entry on the various Windows 8 editions, which also includes a massive spreadsheet that visually details which features are available in which editions of the operating system. While it’s a bit light on information about the specific utilities, it's a very handy resource for comparing the feature sets of Windows RT and the various Windows 8 editions at a glance.